© 2002, © 2017 by Paul Freeman. Revised 11/26/17. 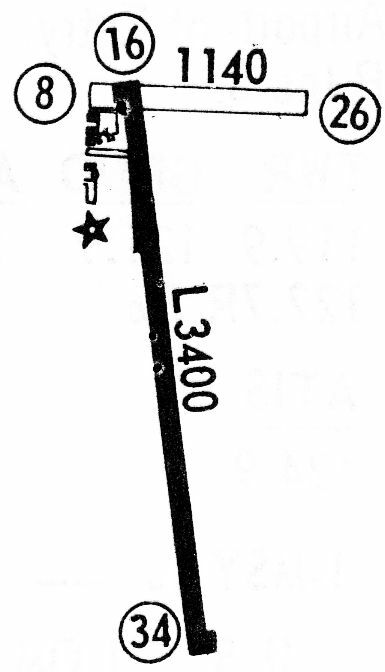 Lucien Airport, as depicted on the February 1949 Shreveport Sectional Chart (courtesy of Chris Kennedy). 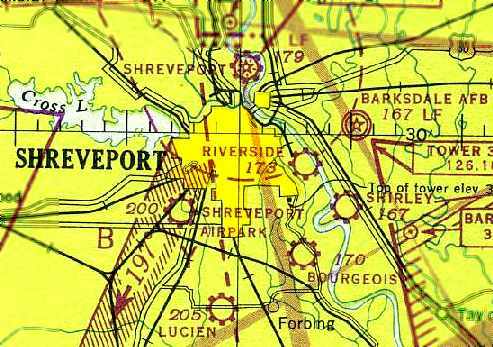 as it was not yet depicted on the September 1946 Shreveport Sectional Chart (courtesy of Chris Kennedy) or the 1948 USGS topo map. was in the Civil Aeronautics Administration's August 1948 Airman's Guide (according to Chris Kennedy). It described Lucien as having 2 unpaved runways, with the longest being 3,100'. was on the February 1949 Shreveport Sectional Chart (courtesy of Chris Kennedy). It depicted Lucien as a commercial/municipal airport. According to Robin Elston, “Lucien was originally owned by Jim Clark. with a few small buildings on the north end of the field. The earliest photos which have been located of Lucien Airport were two 1961 photos of Al Elston & his Aeronca Chief (courtesy of Robin Elston). A 1962 aerial view looking north at the Lucien Field hangar, with 18 planes on the field (courtesy of Rick Shelton). depicted Lucien as a public-use airport having a 3,000' unpaved runway. with the hangar visible in the background. with a taxiway leading a ramp & a building on the west side. 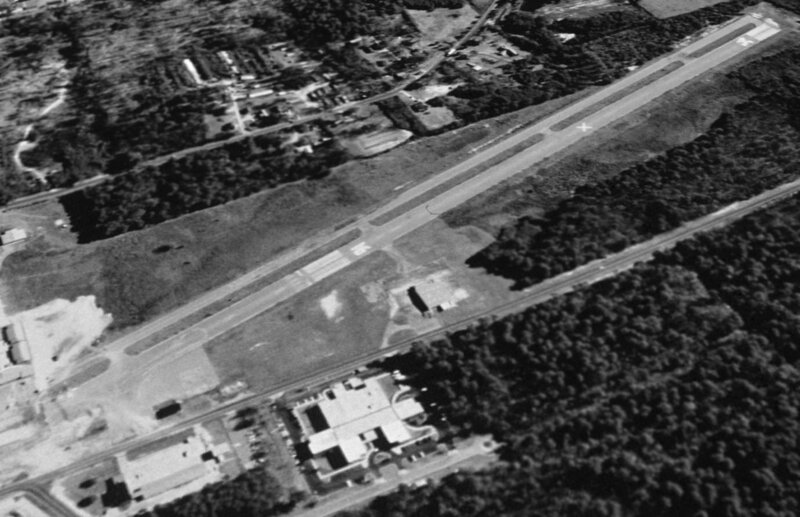 A 2/12/69 USGS aerial view depicted Lucien Field as having a single north/south runway. 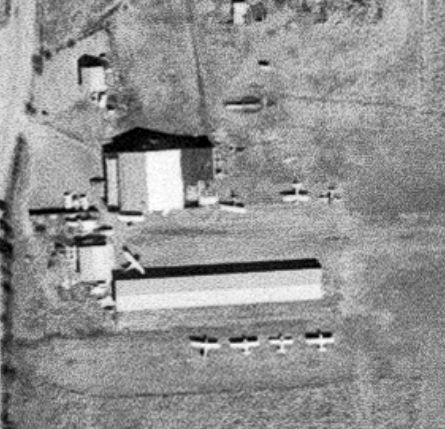 A closeup from the 2/12/69 USGS aerial view depicted a total of 8 light single-engine planes parked around the Lucien Field hangars. described Lucien as having a single unpaved 3,000' Runway 17/35. 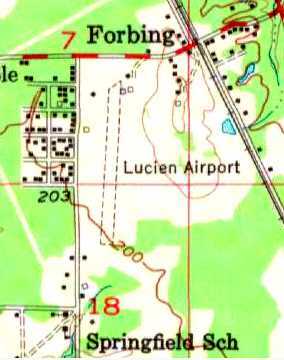 Lucien Airport was still depicted as a public-use airport in 1976 AOPA Airport Directory (according to Chris Kennedy). as that is how it was depicted on the May 1977 Memphis Sectional Chart (according to Chris Kennedy). described Lucien as having a 1,925' blacktop runway (with an additional 625' of turf). Ken Harris recalled, “I learned to fly at Lucien Field back in 1986…. Ray Harvey owned & operated the airport. Making a living renting a several Cessna 150s & a Cessna 172 mostly to people taking flying lessons. I owned my own Skyhawk. Those long rows were not hangars but simply roofs under which I, and others, rented space to park our airplanes. I asked Mr. Harvey who Lucien Field was named after & he told me, 'Lucien Marineaux'. Mr. Harvey’s son worked there & he was an Airframe & Powerplant Mechanic as well. A 1989 USGS aerial view looking northwest showed that Lucien Field had gained a considerable number of hangars at some point between 1969-89. A 1990 photo by Robin Elston looking east from the northwest corner of the hangar at the aircraft salvage yard. I wish I had a picture of his other work in progress, a C152 built from several planes, it looked it! I suppose N738KM looked similarly before it's paint job. The 152 was bare aluminum, red, maybe a yellow door, tail numbers in black electrical tape (N666LS). He asked if I minded the number saying one of the young female students wouldn't fly it. I figured the Lord's going to take me when my time is up regardless of the tail number. I took it around the pattern intending to depart, however landing when the alternator light came on. Explaining the light, he reached through the window, flipped the master off, back on and whacked the panel with his palm. The light went out & he said you're good to go. with several hangars along the west side. A 1992 photo by Robin Elston looking northwest at the Lucien hangar (the same perspective as the 1967 photo). A 1992 photo by Robin Elston of Ray Harvey & Al Elston. 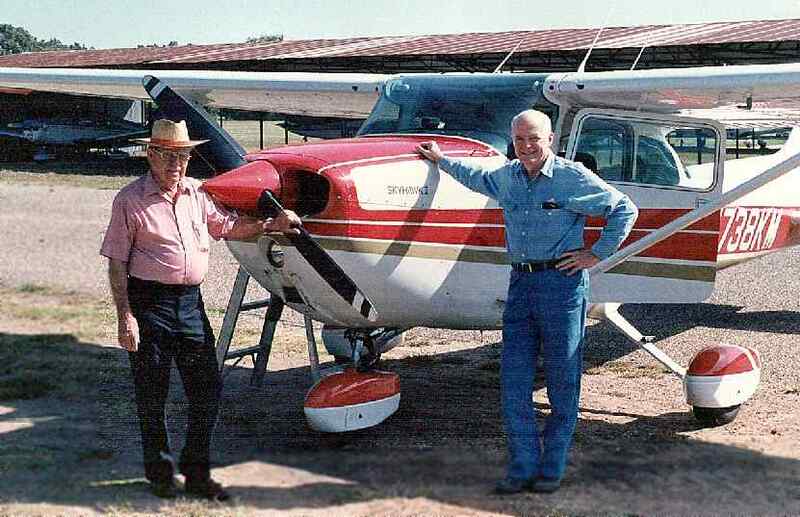 Robin observed, “Here's the Cessna & it's builder in the hat on the left (Ray Harvey) and my dad on the right in jeans (Al Elston). Rick Shelton recalled, “If it was not for Ray Harvey I would not had the chance to get my Private Pilots License. He would let me work around the field, cutting grass, pumping gas & such. I worked for hours in N666LS and N8945 and N738KM. A 1994 aerial view by Carl Hennigan depicted only a single plane parked outside at Lucien. 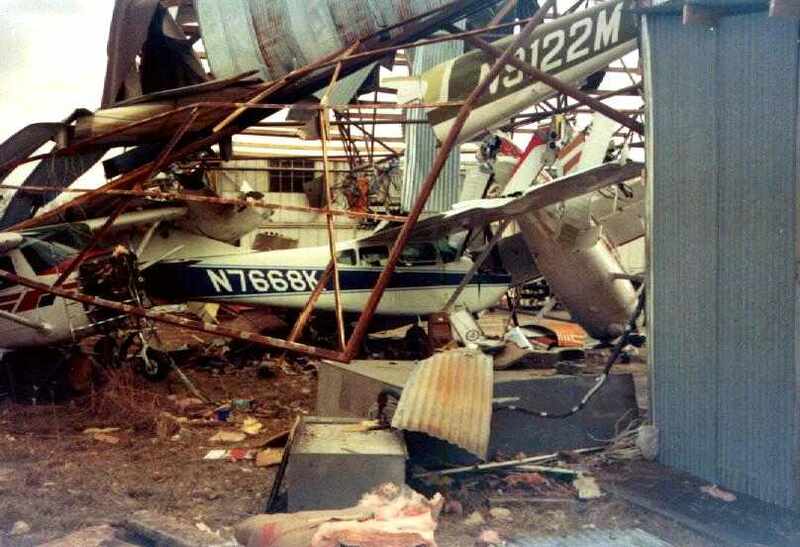 and the destruction of the Cessna 172 N738KM & Cessna 152 N666LS that Ray Harvey had rebuilt. 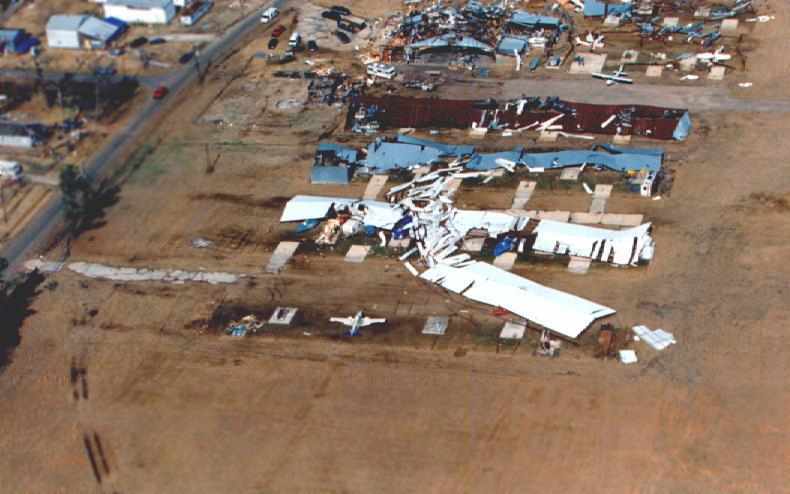 showing the damage to hangars & planes from the 1996 tornado . as a result of the 1996 tornado. A March 2002 USGS aerial view looking northwest at Lucien Airport, with 2 intact planes still visible on the field (along with the scrap pile). 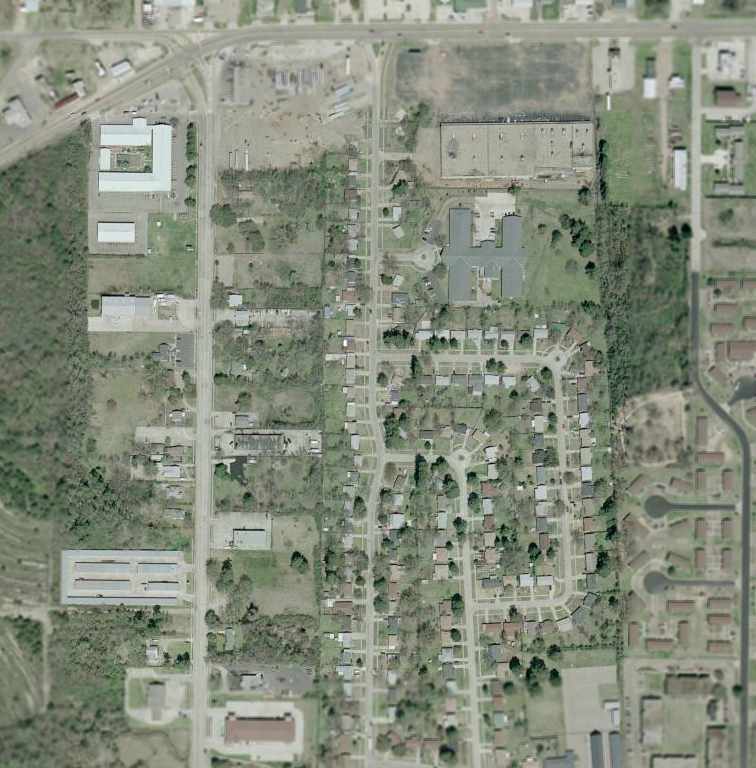 Note the decided lack of buildings compared to the 1992 photo (due to damage from a 1996 tornado). 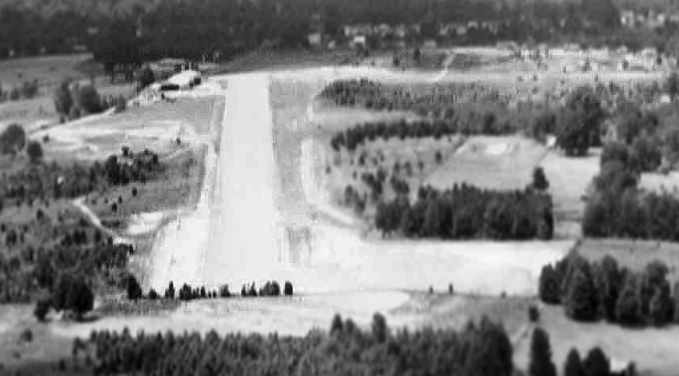 It depicted Lucien as a private field having a single 1,900' paved runway. 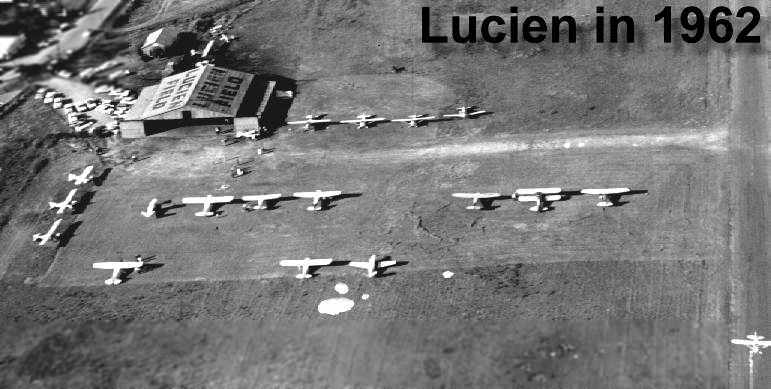 The last photo which has been located showing aircraft at Lucien Field was a July 2004 aerial view by Carl Hennigan, taken “shortly before Lucien closed looking southeast. One intact plane sat in between the runway & the hangars. A June 2006 photo by Robin Elston looking northwest at the Lucien hangar. Robin observed, “Note the new sheetmetal & lack of other structures, the result of the tornado in 1996. A June 2006 photo by Robin Elston looking north along the remains of Lucien's Runway 35. Robin reported, “Obviously the property gets mowed. A May 2007 aerial view by Carl Hennigan looking east at Lucien Airport. 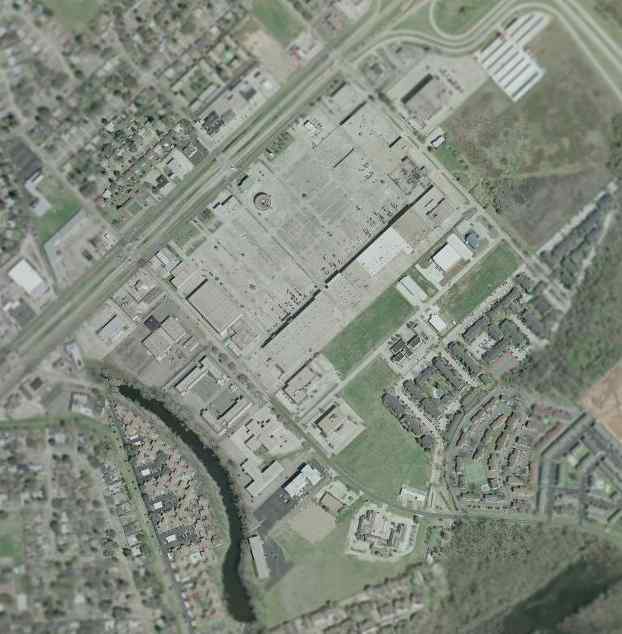 Note that in comparison to the 2004 aerial photo, there is only 1 hangar remaining. 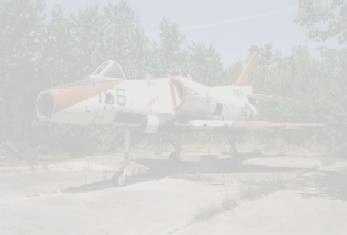 Carl observed, “The aircraft salvage area was on the north side of the main hangar. This is the light brown rectangular area just north (to the left of the main hangar). nor listed among the FAA Airport/Facility Directory as of 2007. A 2016 aerial view looking northwest at the site of Lucien Airport shows that the runway pavement has been removed, but the main hangar remained erect. 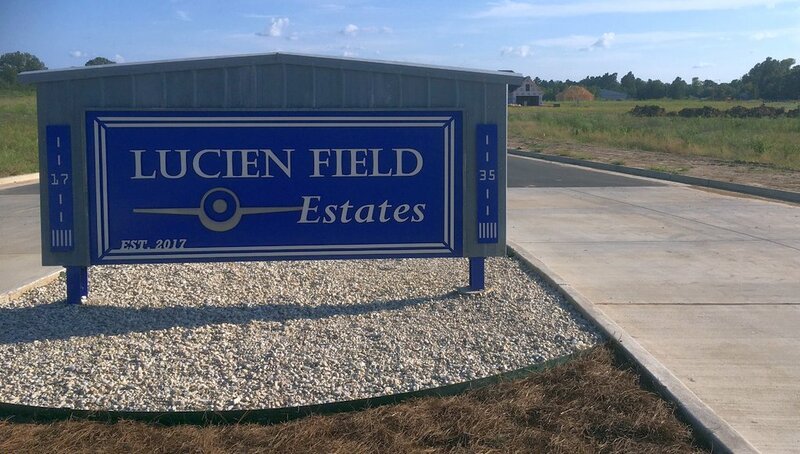 A 2017 photo by Steve W of the sign for “Lucien Field Estates” at the site of Lucien Field. 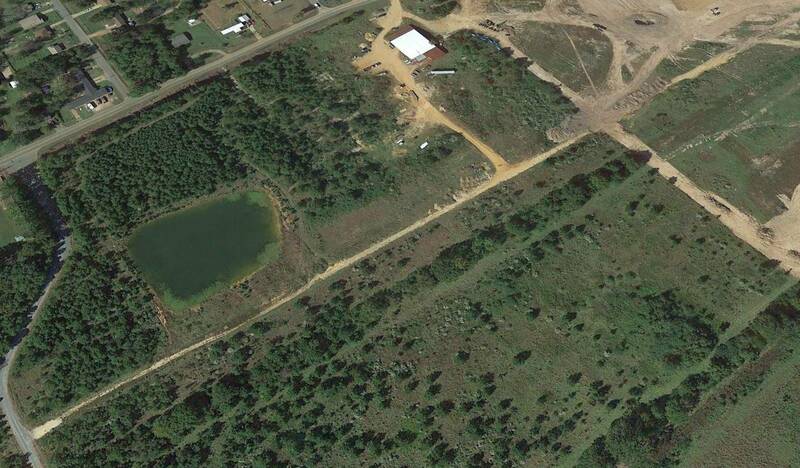 The site of Lucien Airport is located southeast of the intersection of Wallace Lake Road & East Flourney Lucas Road. A 6/1/1930 aerial view looking northwest at Texaco Airport (courtesy of Carl Hennigan). 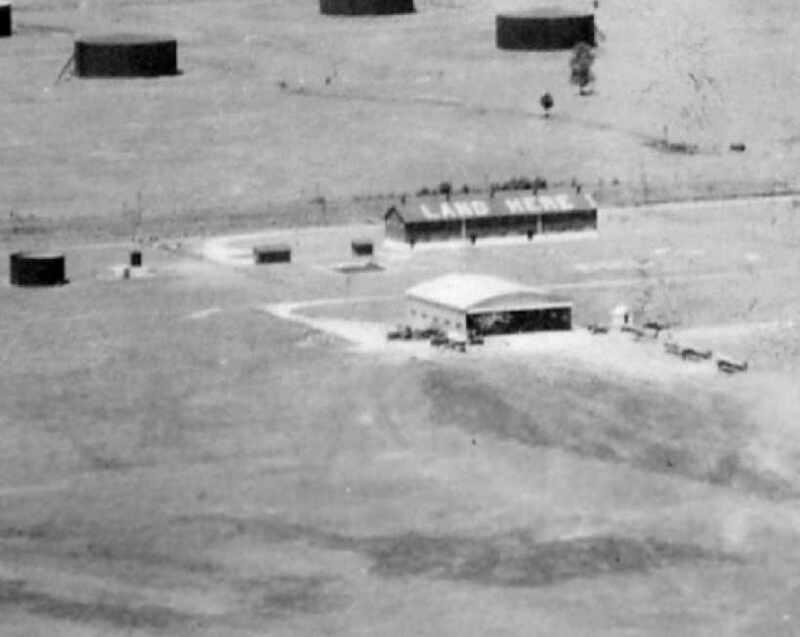 The Texaco oil storage tanks were visible behind the airfield. According to Carl Hennigan, “In 1930 the Texaco Airfield was opened on the southern side of Shreveport. with several planes in front of the field. The field was said to have facilities for servicing aircraft, day only. in the Haire Publishing Company's 1946 Airfield Directory (courtesy of David Brooks). A circa 1940s aerial view of the Texaco Airport (courtesy of Carl Hennigan). Several planes were visible on the field. (which dates the photo to post-WW2). as that is how it was listed in the Haire Publishing Company's 1948 Airport Directory (courtesy of David Brooks). The field was said to have 2 unpaved runways: 2,000' north/south & 1,800' east/west. Riverside was described as a commercial field, offering a hangar, fuel, repairs, and training. The manager was listed as K.R. Bailey. It depicted Riverside as a commercial/municipal airport. was on the 1952 Shreveport Sectional Chart (according to David Brooks). was in the 1953 Aviation Week Airport Directory (courtesy of David Brooks). having 2 unpaved runways: 2,300' north/south & 1,700' east/west. The field was said to offer fuel, repairs, and training. The manager was listed as H.A. Dickerson. Riverside Airport evidently closed at some point after 1953.
with the Red River Bridge under construction. 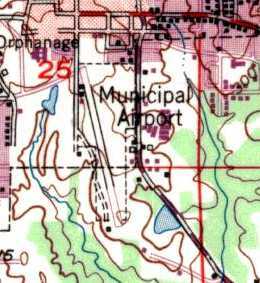 By the time of the 1955 USGS topo map, the former Texaco Airport was no longer depicted. 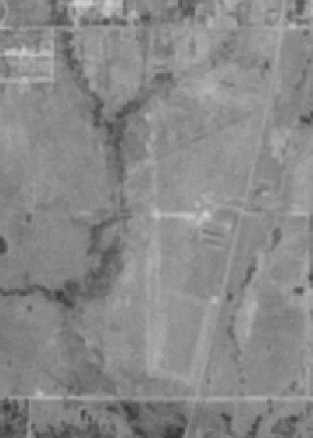 There was no remaining trace of Texaco Airport still perceptible in the 1998 USGS aerial photo. 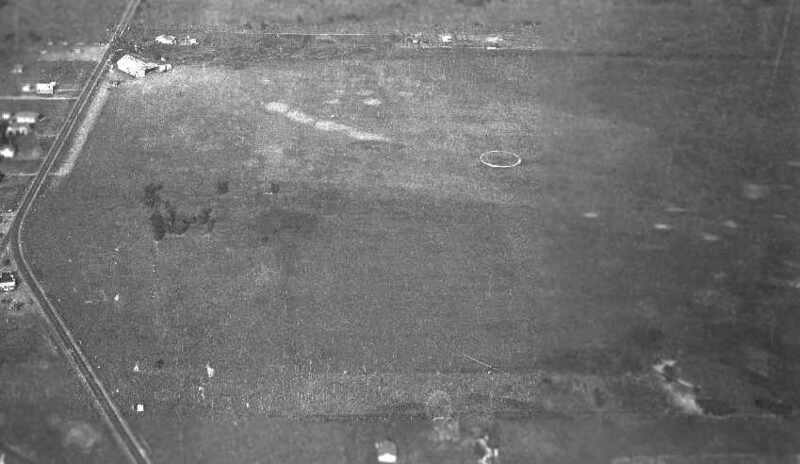 As seen in the 2002 USGS aerial photo, the site of Texaco Airport does not bear any recognizable trace of the airfield. 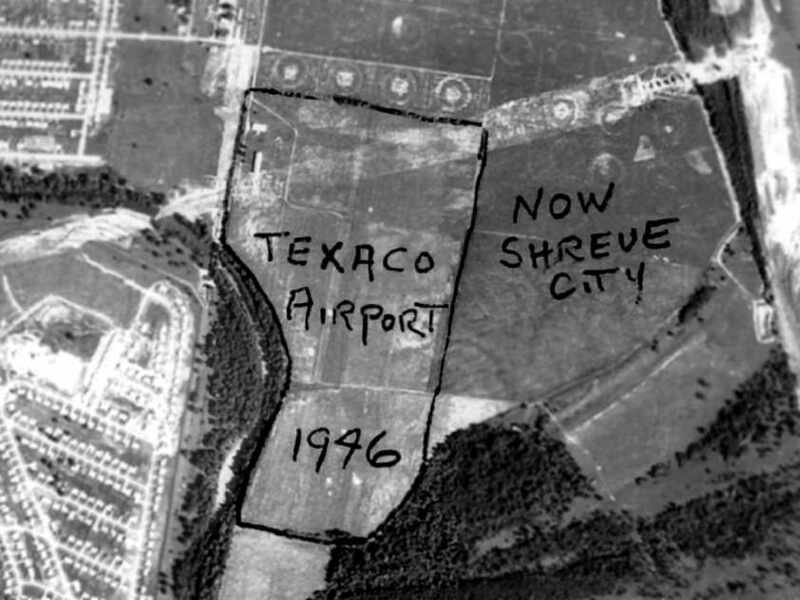 The site of Texaco Airport is located south of the intersection of Shreveport Barksdale Highway & Knight Street. with Mansfield Road visible along the top-right. According to Carl Hennigan, “Stovall Airport was one of the earliest airports to operate in the Shreveport area. It was built around 1924.
depicted the field as having 2 runways, 2 rows of T-hangars, and a larger hangar. showing a dozen light aircraft. or the 1944 USGS topo map. was on the 1944 Shreveport Sectional Chart (courtesy of Carl Hennigan). It depicted Stoval as a commercial/municipal field. owned by Ralph Brandon & operated by Clifton Stovall. with the longest being the 2,700' northeast/southwest strip. The field was also said to have 2 hangars, and to offer charter, training, repairs, and fuel. 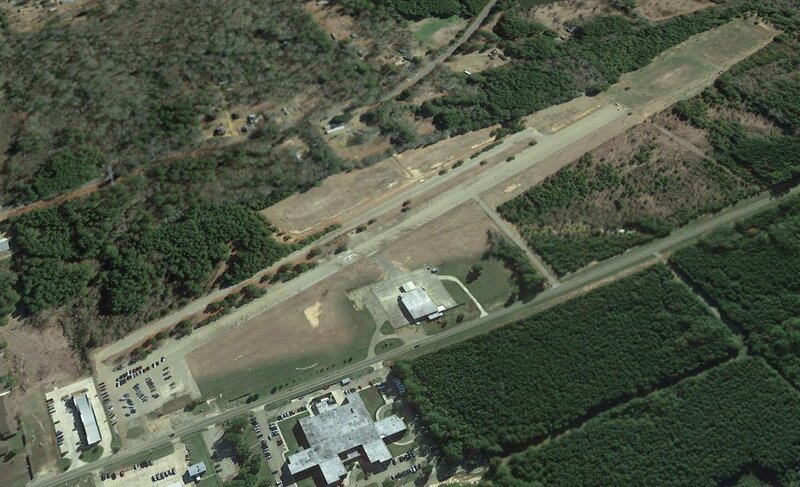 described Stovall Field as a “class 2” airfield, owned by George McMurray & operated by Clifton Stovall. having 4 all-way sod strips, with the longest being the 2,600' northeast/southwest strip. Stovall was described as having 2 hangars, and offering repairs, fuel, training, and charter. as that is how it was labeled on the September 1946 Shreveport Sectional Chart (courtesy of Chris Kennedy). [as Sunset Acres was the name of the local neighborhood]. 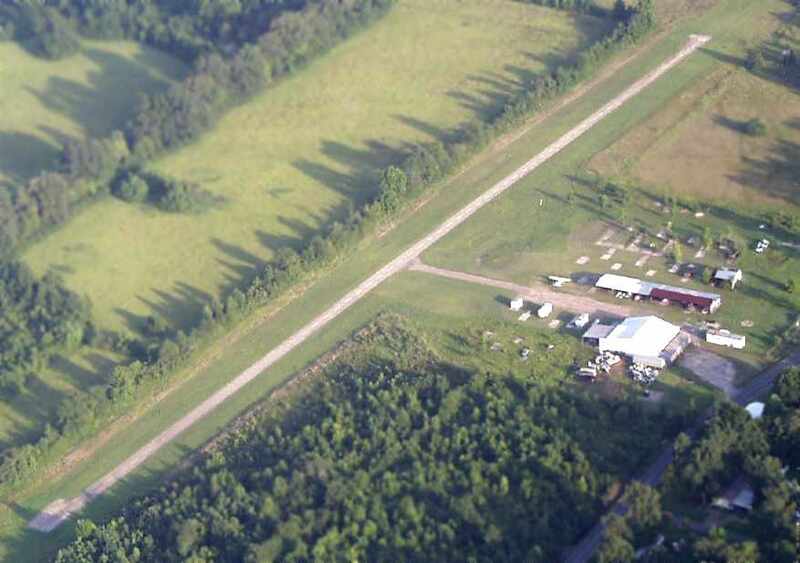 described Shreveport Airpark as having 3 unpaved runways, with the longest being the 5,000' north/south strip. offering hangars, fuel, repairs, training, charter, and sales. The manager was listed as Kirby Shaw. 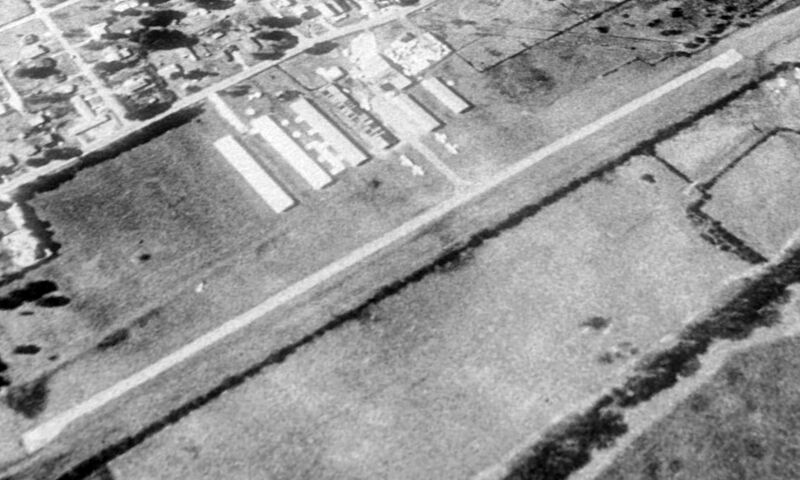 The last photo which has been located of Shreveport Airpark was on a 11/16/49 aerial photo. 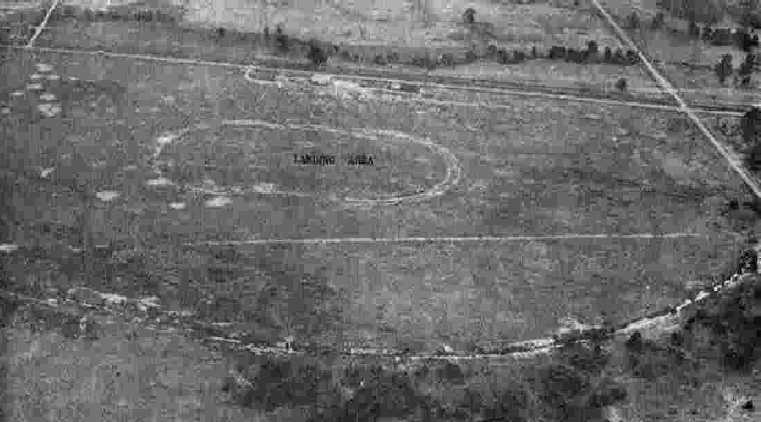 It depicted the field as having 2 runways, with some buildings along the east side. or the 1966 USGS topo map. 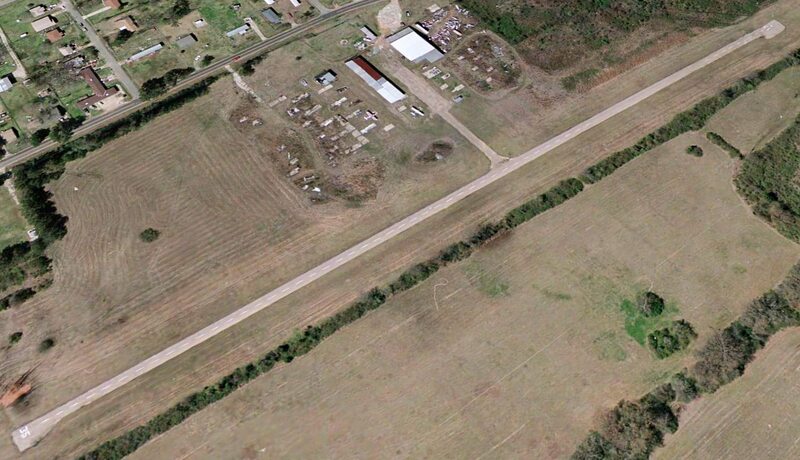 There was no remaining trace of the former Stovall Airport still perceptible in the 1998 USGS aerial photo. 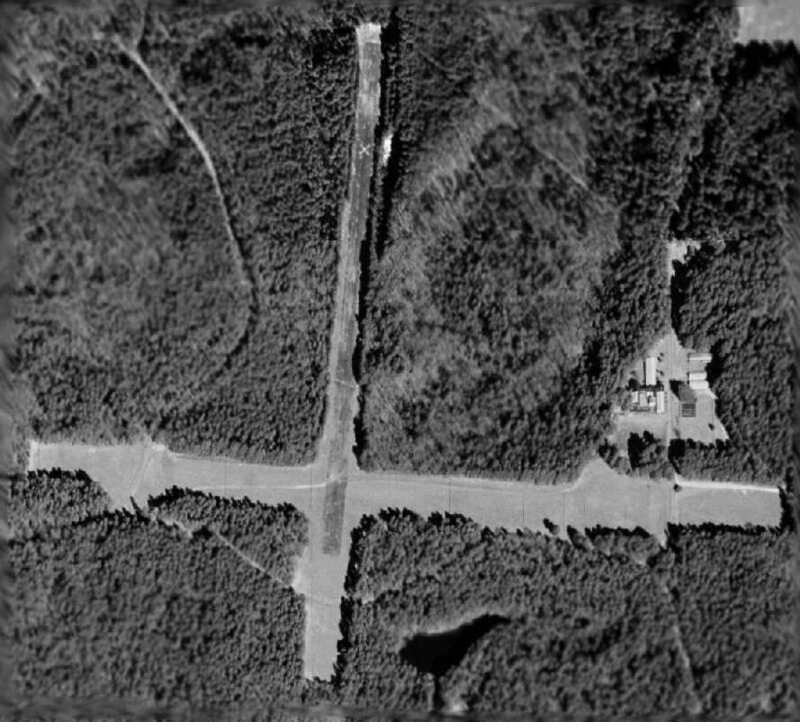 As seen in the 2002 USGS aerial photo, the site of Stovall Airport does not bear any recognizable trace of the airfield. 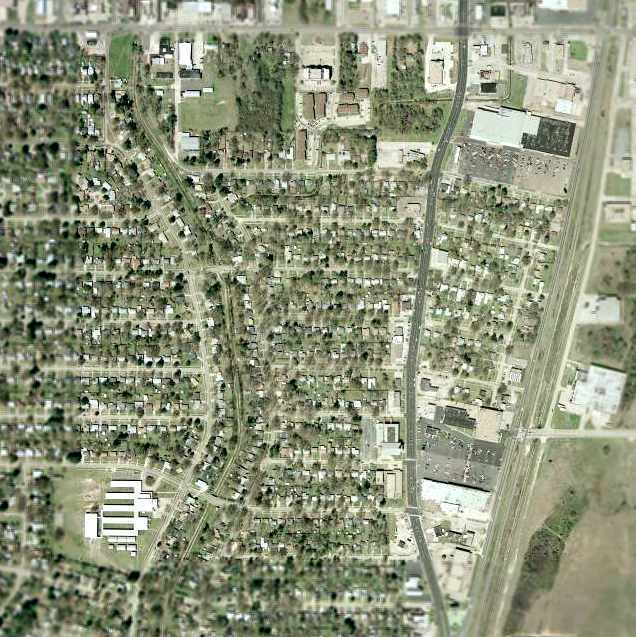 The site of Stovall Airport is located southwest of the intersection of Hollywood Avenue & Mansfield Road. An undated (circa 1929) aerial view looking east at Shreveport Airport (courtesy of Carl Hennigan). According to Carl Hennigan, “Opening in 1928 was the Shreveport Airport. 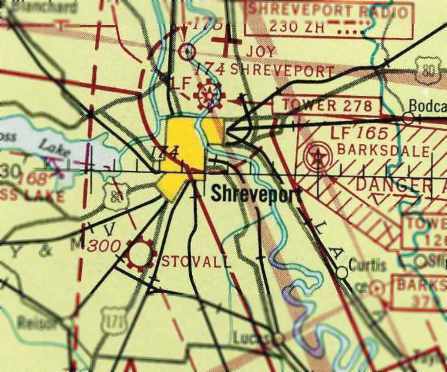 It was located about five miles west of the city & was operated by the Shreveport Airways Company Inc.
depicted the field as having a square grass landing area with a single hangar on the northeast corner. showing a monoplane & several biplanes. 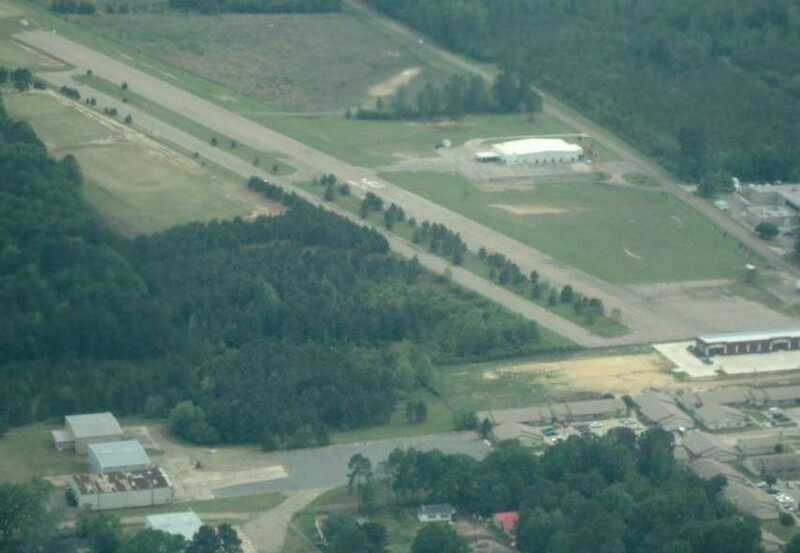 due to the opening of the Shreveport Municipal Airport on an adjacent plot of land to the south. 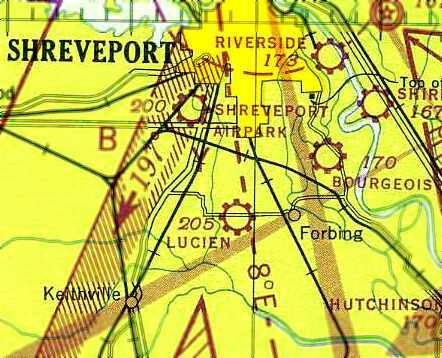 as it was not depicted at all on the 1934 or 1942 Shreveport Sectional Charts. 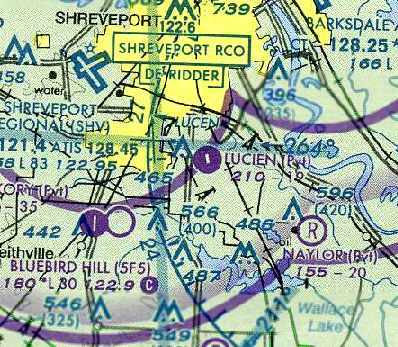 There was no remaining trace of the original Shreveport Airport still perceptible in the 1998 USGS aerial photo. 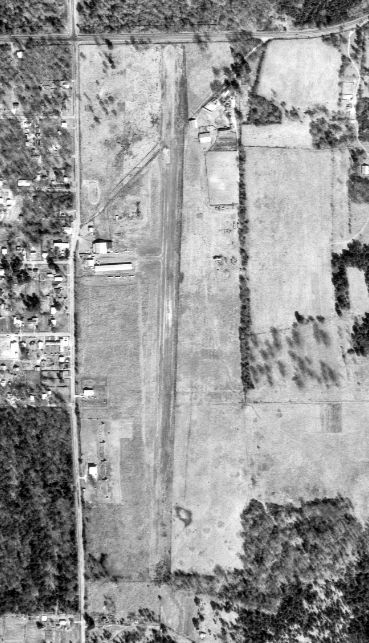 As seen in the 2002 USGS aerial photo, the site of the original Shreveport Airport does not bear any recognizable trace of the airfield. 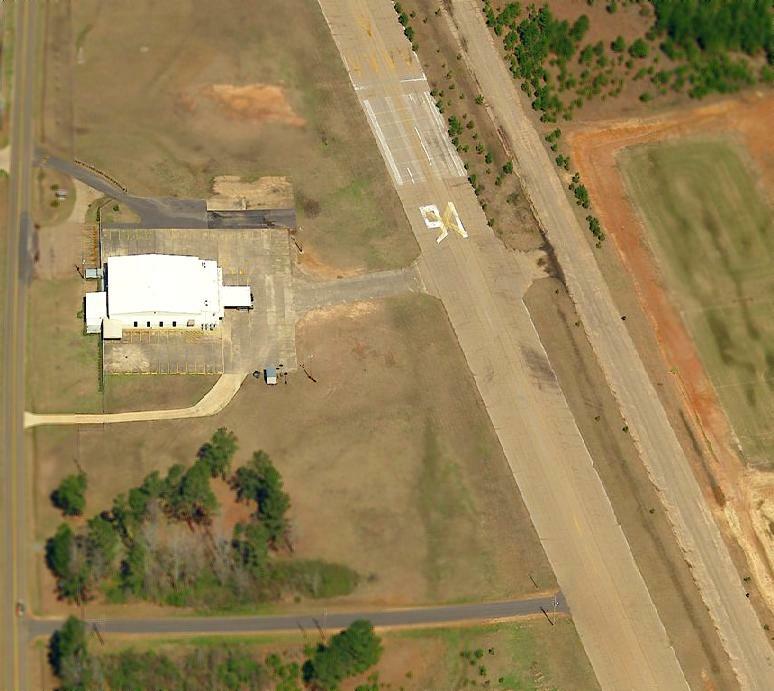 The site of Shreveport Airport is located south of the intersection of Greenwood Road & Monkhouse Drive. The present-day Shreveport Regional Airport is located just on the other side of Interstate 20 to the south. 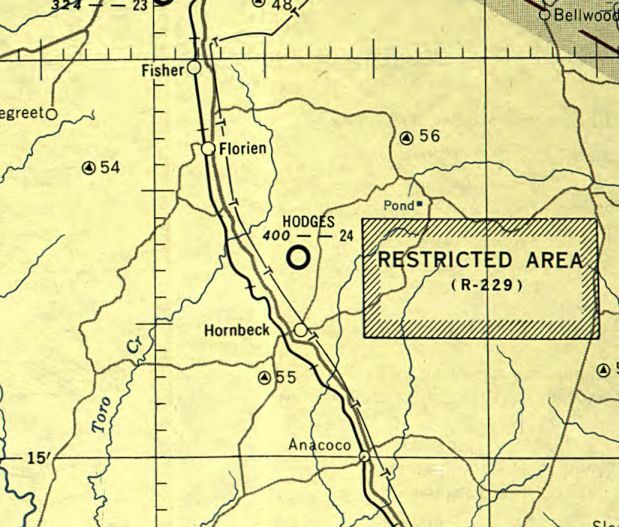 Hodges Airfield, as depicted on the 1954 USGS topo map. as it was not yet depicted on the February 1950 Beaumont Sectional Chart. 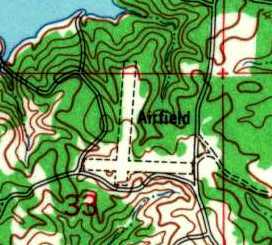 The earliest depiction which has been located of the Hodges Airfield was on the 1954 USGS topo map. 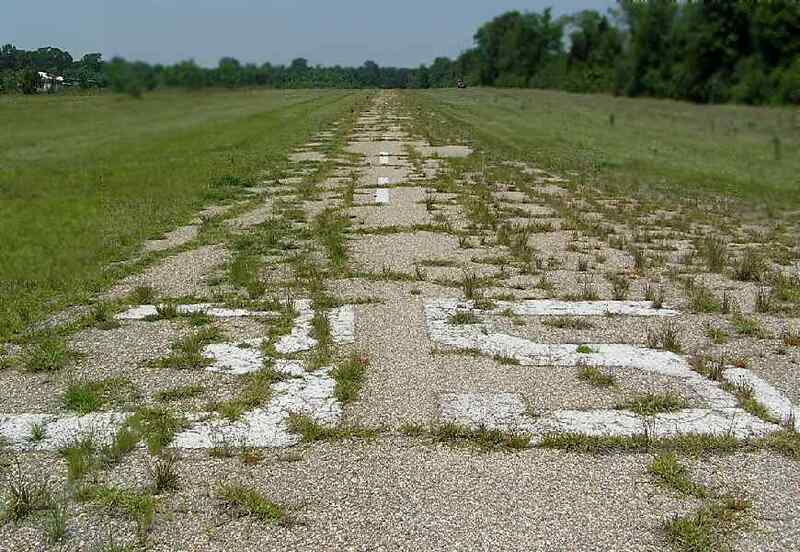 It depicted 2 unpaved runways, labeled simply as “Airfield”. The earliest aeronautical chart depiction which has been located of Hodges Airfield was on the February 1955 Beaumont Sectional Chart. It depicted Hodges as having a 2,400' unpaved runway. The earliest directory listing which has been located of the Hodges Airfield was in the 1962 AOPA Airport Directory. along with the remarks: "Caution: Private airstrip, emergency use only. Do not use E-W sod strip." [which is still is still in operation, described as the largest privately owned botanical gardens in the US]. The last aeronautical chart depiction which has been located showing Hodges Airfield still open was on the September 1967 Beaumont Sectional Chart (courtesy of Chris Kennedy). 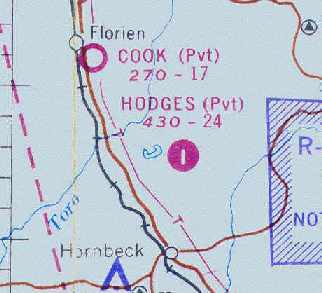 It depicted Hodges as a private airfield, and the Aerodromes table described the field as having 2 runways, with the longest being a 2,400' asphalt strip. (which typically indicates that the airfield was no longer operational by that point). 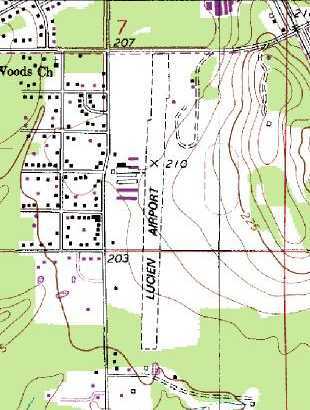 Hodges Airfield was evidently closed by 1998, as it was depicted as an abandoned airfield on the 1998 World Aeronautical Chart. with the closed runway "X" markings still plainly visible. A 7/23/07 USDA aerial view looking southeast showed the Hodges Airfield to remain in fine condition. 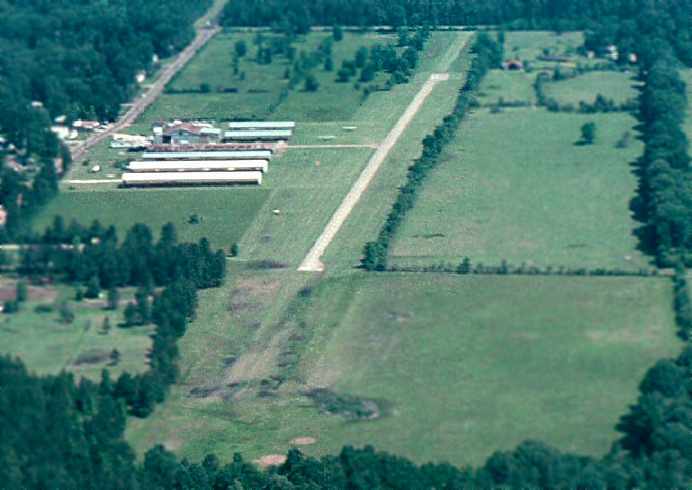 The Hodges Airfield is located southwest of the intersection of Hodges Loop & Plainview Road. 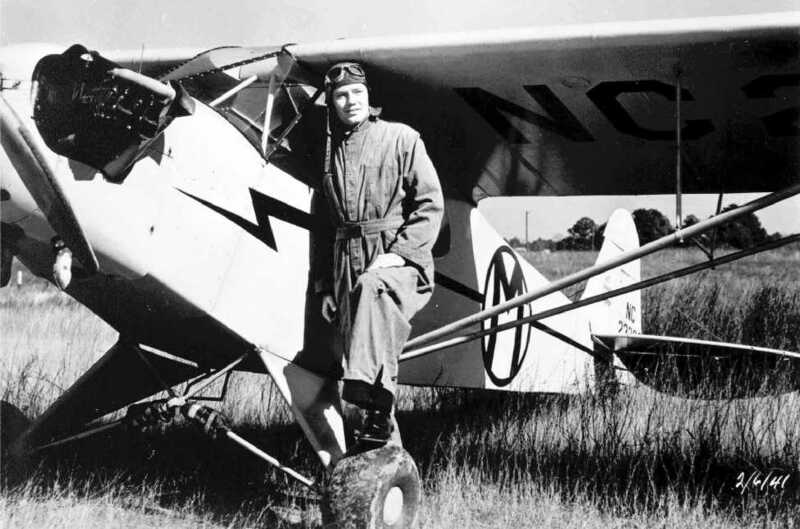 A 2/6/41 photo of Savery Lewis Stuckey in front of a Piper Cub presumably at Ruston Airport (courtesy of Mark Stuckey). mostly due to my father's (Savery L. Stuckey) diligence & enthusiasm. as a Civilian Aeronautics Administration emergency airfield along U.S. Skyway One. The property was fenced with fence posts painted black & yellow. The beacon light was part of the U.S. Skyway One visual identifiers. According to Savery L. Stuckey, “I guess it was in the 1930s that Barnstormers began to fly into Ruston. One of them was Reggie Robins flying a tri-motored Ford airplane which could carry 14 passengers at a time. An instructor, named Norman 'Pop' Wise, started coming into Ruston in a Piper Cub in the 1930s. Sam Stuckey continued, “The Town of Ruston purchased an additional 15 acres... in 1945.
on the 1945 Shreveport Sectional Chart (courtesy of John Voss). for $1 a year if I would start a flight school & work toward building an airport. He did lease it to me for 10 years, with option to renew. I renewed the lease 2 times. All that time I operated a Flight School until 1968.
thanks to the donated equipment & expertise of the T. L. James Company, home-based in Ruston. was on the September 1946 Shreveport Sectional Chart (courtesy of Chris Kennedy). 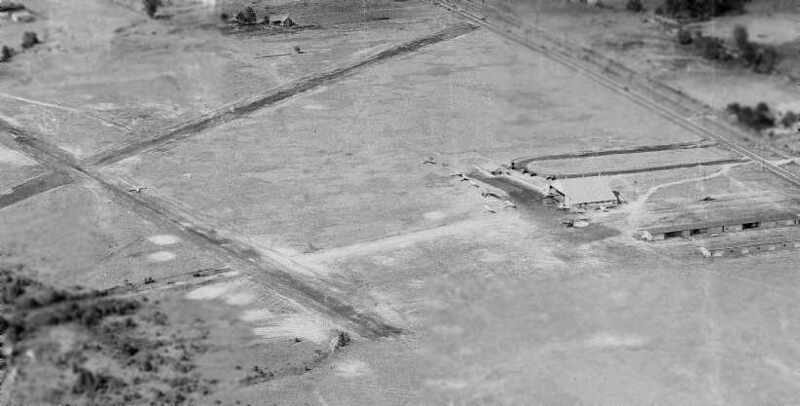 A 1946 aerial view (courtesy of Sam Stuckey) looking northwest at the north end of Ruston Municipal Airport. and portions of the paved Runway 16/34 & turf Runways 9/27 & 3/21. and included a small office, 2 restrooms, a lounge area, and a small covered porch. 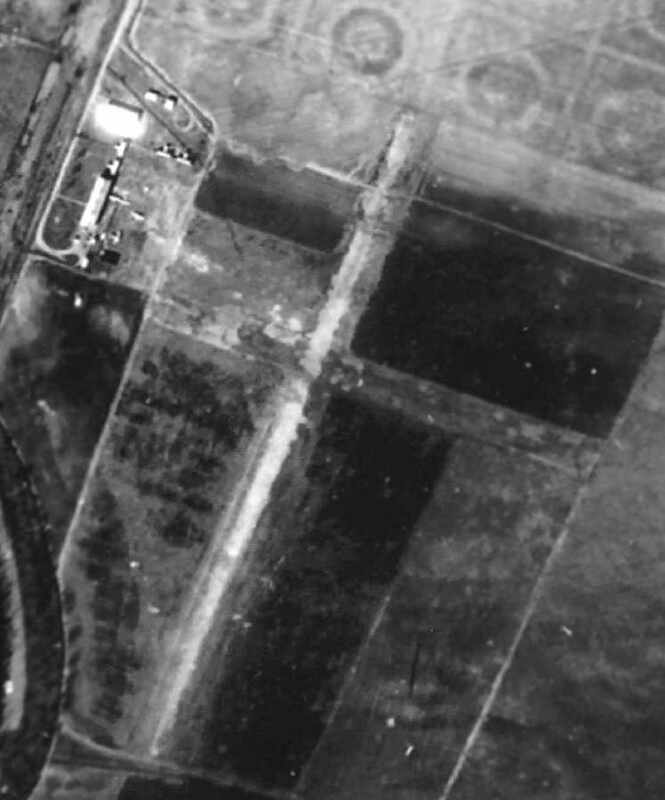 A circa 1947-48 aerial view (courtesy of Sam Stuckey) looking north along Ruston's Runway 34. The T.L. 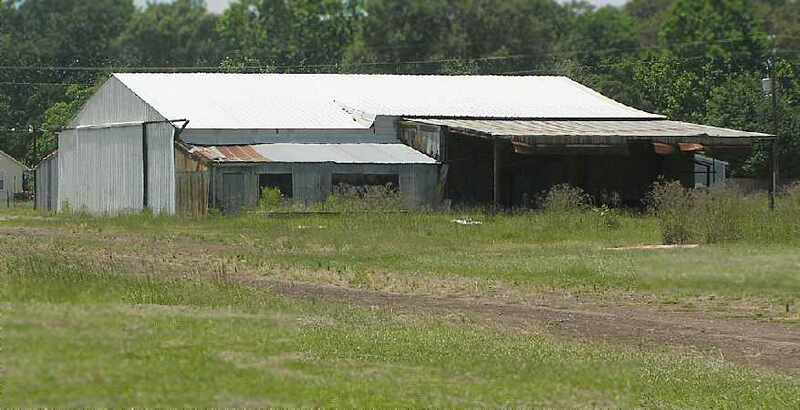 James Company hangar (which housed their company aircraft) is visible adjacent to the original hangar. and another turf runway aligned approximately 3/21 was about the same length. on many days there would be 6 or 7 birds in the traffic pattern at the same time. on top of a Stuckey's Flying Service Cessna T-50 presumably at Ruston Airport. making the paved part 3,466' long. 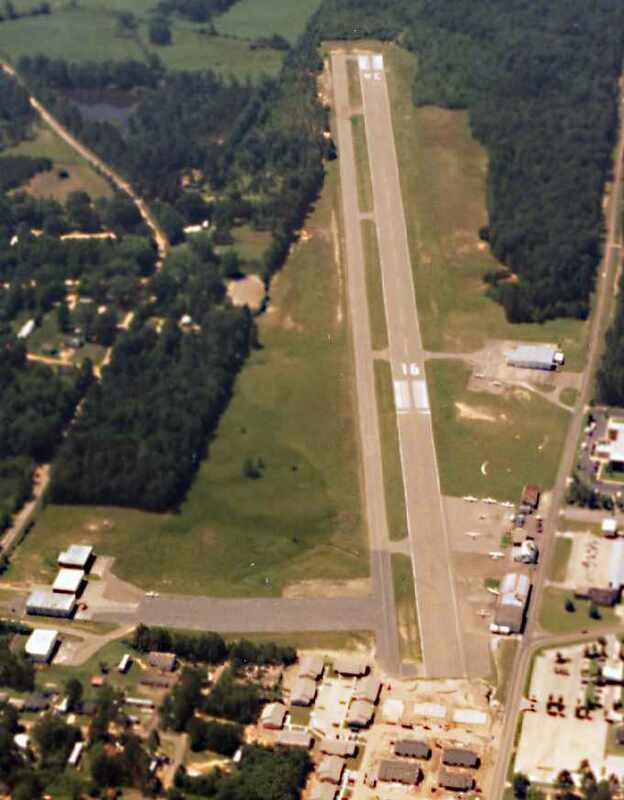 The 1962 AOPA Airport Directory described Ruston Municipal as having a single 3,500' paved runway. 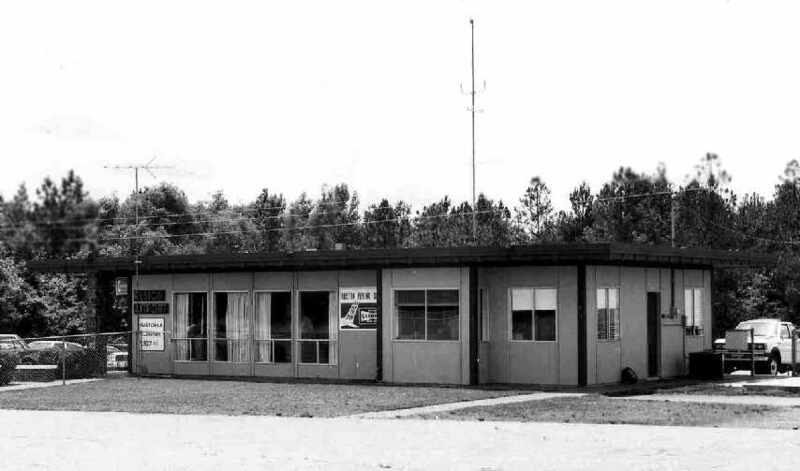 A 1964 photo by John Wood of the Ruston Airport office, from his book “Come to Beautiful Ruston: A Wonderful Place to Live”. John reported in 2015, “Many small airports have chairs lined up parallel with the runway, as seen here, so pilots' landing performance can be graded by the peanut gallery. According to Sam Stuckey, “My dad served as the City's airport manager & as the Fixed Base Operator until 1968. He sold his assets to a group known as Lincoln Services Inc., which was a section of the T. L. James Company. 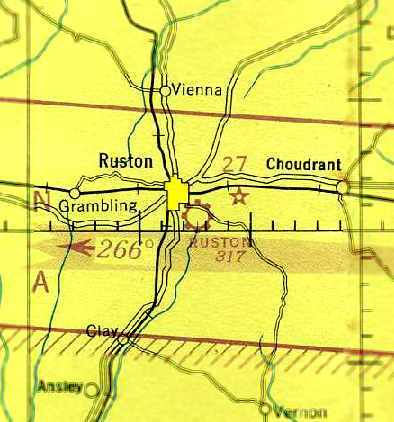 The 1968 Flight Guide (courtesy of Robert Levittan) depicted Ruston Airport as having a paved 3,400' Runway 16/33 & an unpaved 1,140' Runway 8/26. Several buildings were depicted on the west side. Robert Carona recalled, “I flew out of the Ruston Airport from September 1969 until March 1978. We lived in a house located in a field just east & about center of the airport on Moores Dairy Road, we could see the airplanes taxiing around from our back yard. I remember seeing & talking to Sam Stuckey around the airport. Every one called him Mr. Stuckey. 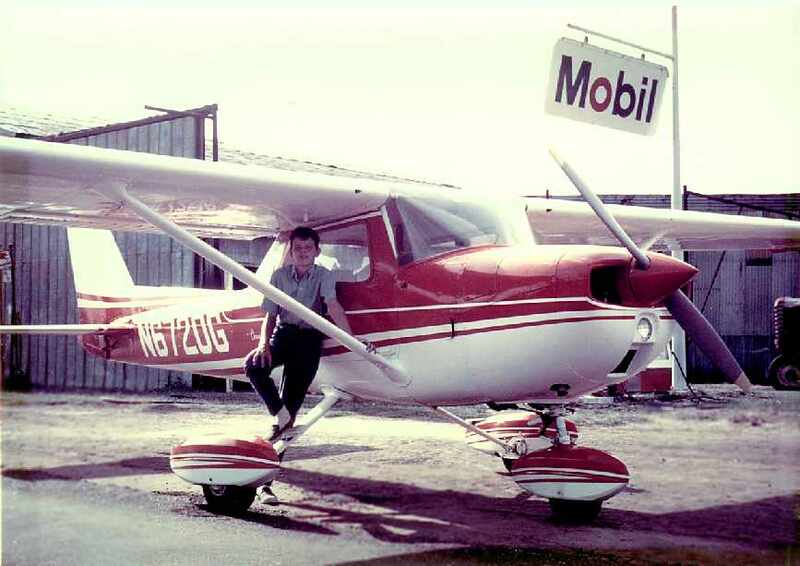 I started my aviation career at LA Tech in 69 & graduated from Professional Aviation in 73. After graduation I went to work at Lincoln Services as a flight instructor & charter pilot. at the time they had 2 Twin Bonanzas, a Beech Baron & a King Air. 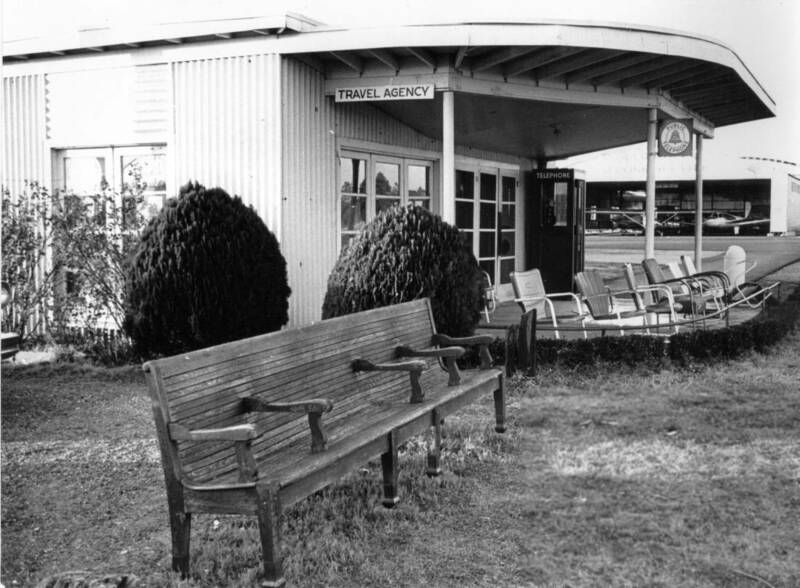 A new terminal building was constructed at Ruston in 1969, according to Sam Stuckey. Sam Stuckey continued, “After the sale Dad continued to work at the airport for Lincoln Services, Inc. until 1970. 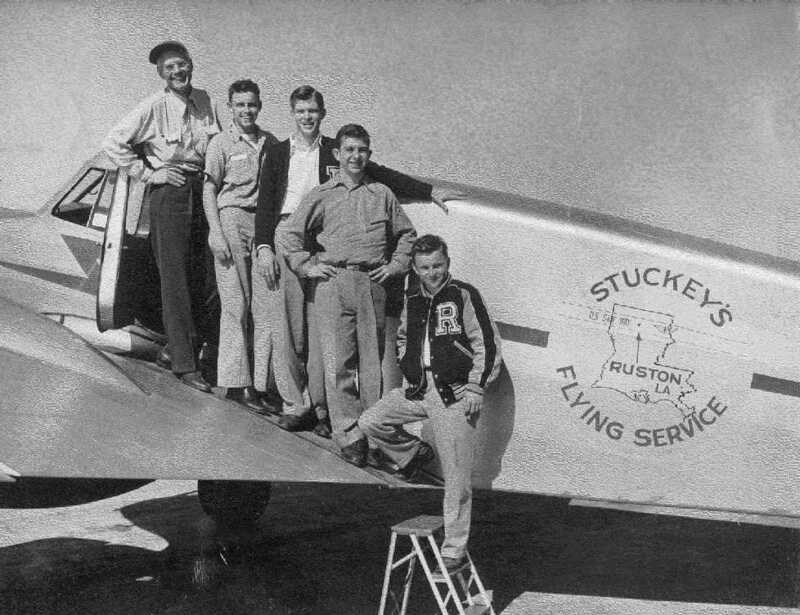 Sam Stuckey continued, “Sometime in the 1970s the name was changed to Ruston Flying Service. 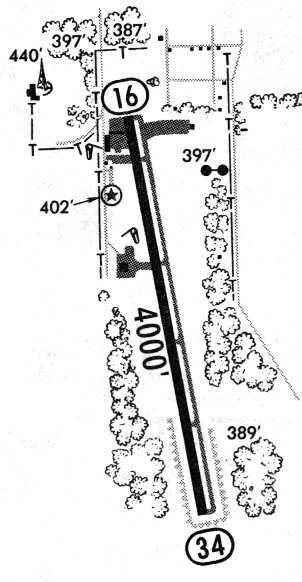 Another 500' [to the length of the paved runway] were added sometime in the 1970s. as having a 3,466' paved Runway 16/34 and an 1,140' turf Runway 8/26. a 5-member board, to look after growing airport needs. with a parallel taxiway along the east side. along the western, northwestern, and northeastern sides of the runway. and listed the operator as Ruston Flying Service. A circa 1980s photo (courtesy of Sam Stuckey) of the Ruston terminal building. and a few local businesses. showing at least 9 light aircraft parked on the field. and the inability to acquire additional real estate to extend the runway any further. My dad had some input into the new airport layout, but did not live to see it become a reality. and would not allow my dad's name to be part of it. to dedicate the terminal building at the new airport with my dad's name, and that was accomplished in 2005.
was on the 1995 Memphis Sectional Chart (courtesy of David Brooks). 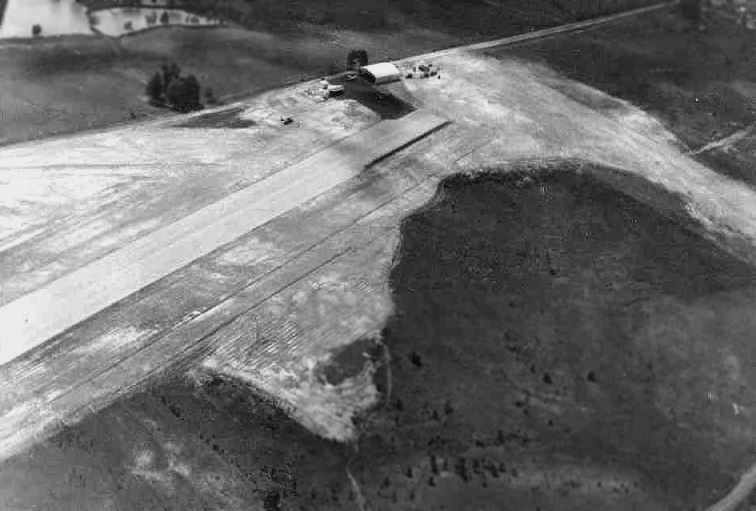 It depicted Ruston Municipal (RSN) as having a single 4,000' paved runway. Note that it also depicted the newer Regional Airport (3L5) to the east, which eventually replaced the original field. 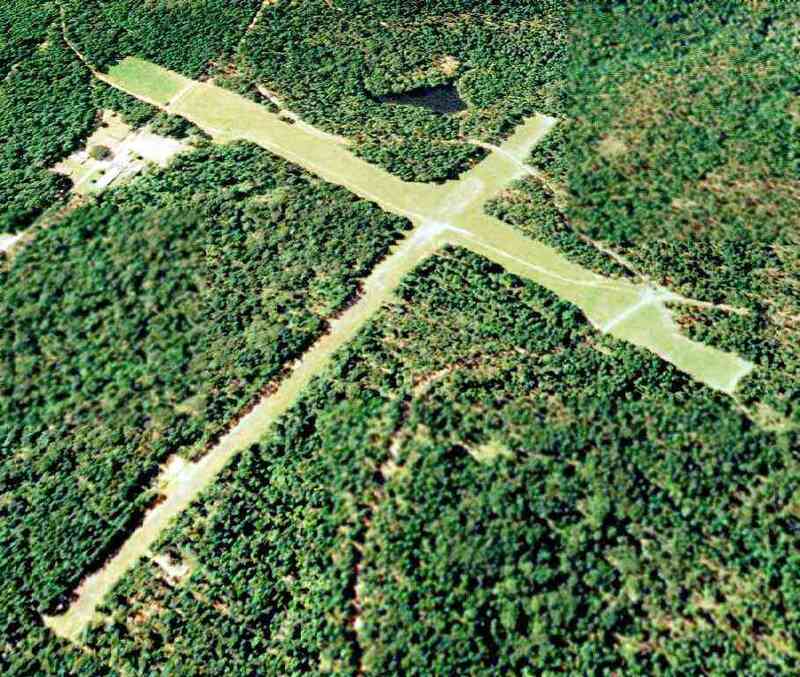 as a 1997 USGS aerial view looking southeast showed the runway marked with closed “X” symbols. and what was once the main operations building now houses a church. 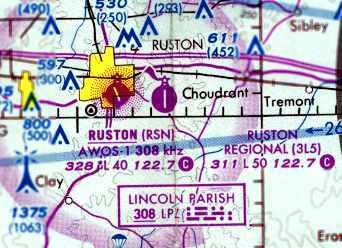 Ruston Municipal Airport was still depicted as an abandoned airfield on 2002 & 2005 Sectional Charts. as well as the north end of former Runway 16/34. the strip & taxiway were being used as parking for the soccer fields that border them (you can see them in the pics, especially on the approach end of [Runway] 34). The white hangar building is now a church. showing the runway & hangars to remain largely intact. but portions of the runway on both ends have been removed. Thanks to Tim Traylor, USAF, for information about Ruston.